David Johnstone, past president of the International Reciprocal Trade Association (IRTA) and former executive with Bartercard in Australia, is now the General Manager of a fast-growing finance company in Southport, Queensland. After leaving Bartercard approximately twelve months ago, he became involved with PR Finance Group which has seen revenues grow from $40 million to $120 million in the past 18 months. Although the new endeavor is a lot of work and very exciting, Johnstone says he does miss interacting with the many fine entrepreneurs he met in the commercial barter industry from around the world. Callaway Golf is looking to barter with you. To do a trade-in and a trade-up for your used golf clubs such as drivers, woods and hybrids, iron sets, wedges, putters, and accessories go to www.callawaygolfpreowned.com. If you are looking for great prices on used golf clubs, golf accessories and apparel, check out www.westcoastgolfonline.com. According to the Bank of International Settlements Triennial Survey of 2007, the average daily global turnover of the foreign exchange market is $3.2 trillion. The Friends in Business Network, which accepts ITEX for membership, has donated 7,000 pounds of food to the North County Foodbank (www.northcountyfoodbank.org) during the past year ending October 23. If your business has surplus assets, you may want to check out a new web site that has been launched in England where you can advertise surplus stock. It�s similar to eBay without the auction side. For more information see www.writebuy.com. Chuck Connor, Secretary of Agriculture, reports that the world�s neediest people remains the cornerstone of America�s food-aid policy. It continues to be the largest single donor to international food-aid programs, providing 55% of the world�s total over the last ten years. Teresa Brewer, who died recently at 76, made her public debut singing �Take Me Out to the Ball Game� on a children�s radio program in Toledo. She was paid in cupcakes and cookies from the show�s sponsor! Aliso Viejo-based (CA) e-tailer Buy.com is launching a weekly half-hour educational and entertainment show for Orange County viewers, to initially promote Buy.tv...with plans to go nationwide by the end of next year. The Buy.com show is similar to the company�s online TV program, which was launched on its web site in May 2006. The National Retail Federation is the world�s largest retail trade group, representing an industry with more than 1.4 million retail establishments nationwide. More than 23 million employees, about one in five American workers, are represented. Sales for 2006 among the member establishments totaled $4.7 trillion. Google hopes that the additional layer of targeting will make its TV advertising sales package even more effective for aiming marketing messages at the people most likely to respond. The company presently has access to a relatively small part of the country�s ad inventory...about 14 million homes, through a deal with EchoStar. Adding the Nielsen data to its current ad target system, which is used primarily on the Internet, is likely to make network TV executives and sales organizations a bit tense. If the system works well, it could take both the marketing and the pricing of inventory out of the �hands� that traditionally control it. In other words, Google could destroy a system for selling TV ads which has been in place for decades. It may not matter that networks and cable systems do not want Google to take away their roles as middlemen. If the new system works, they are out of luck...and time. This could be good news for larger corporations like News Corp. and the Tribune, which are seeking television networks and newspapers in the same market. Martin has scheduled a Dec. 18 vote on the proposal. In the meantime, the FCC will look into loosening the restrictions on the number of television and radio stations a company could own in the same city. This is, of course, great news for the large media corporations. However, because members of the Senate�s Commerce Committee are worried about a �firestorm of protest� in Congress, Senator Daniel Inouye (D-HI), who chairs the committee, has agreed to schedule a hearing on media ownership before Dec. 18 to discuss concerns. Yes, We Have Them All For You. . .
Just scroll down to the bottom of the current report you are reading and you will see our �Archive Section,� which covers issues going all the way back to September 7, 1999. Global Entrepolis Singapore 2007 (GES 2007) has unveiled the agenda for its anchor conference, Captains of Industry. This year's line up includes business leaders and innovators from high-profile businesses worldwide such as Google, World Bank, BMW, Phillips Electronics, and Motorola. Senior executives from these organizations will speak on three topics that have been of global impact recently - Growth, Climate Change and Innovation. The Captains of Industry Conference presents the ideal platform for the exchange of knowledge and experiences with attending C-level executives and senior business managers across various industries. GES 2007 is organized by Zenith Events Management and co-presented by the Singapore Business Federation and the Singapore Economic Development Board. The Captains of Industry Conference will be held on the 13th and 14th of November 2007. 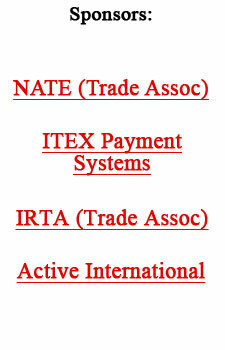 Last year representatives from the International Reciprocal Trade Association (IRTA) attended the conference. For more information visit http://www.globalentrepolis.com/2007/conference_02_captain.htm. I am pleased to report that IRPAC did embrace the barter industry's non-matching TIN/back-up withholding issue, and that section is listed below for your review. Barter Exchanges are defined as third-party record keepers under The Tax Equity and Fiscal Responsibility Act of 1982 (TEFRA) and are grouped together with financial brokerage companies for purposes of Form 1099-B reporting and subsequent B-Notice solicitation requirements for name-TIN mismatches. Barter Exchanges are unable to comply with the backup withholding requirements of Section 3406 because they are not in possession or control of any cash accounts for their clients. Barter Exchanges only control barter/trade accounts which hold �trade dollars,� not cash. Consequently, the backup withholding language of the B-Notice makes an assertion that withholding may occur, when it is impossible for Barter Exchanges to backup withhold, as a matter of fact. Barter Exchanges are then subject to 972CG penalties for the name-TIN mismatches. In order to argue successfully for waiver of the penalty, payers must establish, pursuant to Section 6724, reasonable cause for the failures referenced on the Notice 972CG. In order to establish reasonable cause, payers must explain the manner in which they satisfactorily met the B-Notice solicitation requirements. While Barter Exchanges are able to send the appropriate B-Notices, they are unable to effect backup withholding on the accounts of any recipients who fail to respond. Often, this practice results in a denial of the waiver request, even though all other reasonable cause requirements are met. Consequently, Barter Exchanges must then pursue the appeals process for the denial of the penalty waiver, an undue hardship that results simply from the Barter Exchanges� inability to effect backup withholding on non-cash accounts. There are several methods of alleviating the problem including increased barter industry education, the creation of a revised B-Notice that would be specific to barter exchanges, or legislation to exempt barter exchanges from backup withholding for name-TIN mismatches. First, we recommend that the IRS educate the barter industry on the Form W-9 solicitation and Section 3406 backup withholding requirements through outreach programs that will be effective to reduce 972CG penalties in the future. Second, we request that the language in the current B-Notice be amended to provide language that would be more pertinent to the barter industry. This recommendation could be accomplished by adding the words �to the extent feasible� before the words �the law requires us to backup withhold.� If modifications to current B-Notices are not possible, we recommend the creation of a B-Notice specific to Barter Exchanges that includes the aforementioned language. Third, we suggest that Section 3406 be amended to exempt Barter Exchanges from the backup withholding requirement, since it is impossible for them to comply with the requirement as they are not in control of any payee cash accounts. Finally, we recommend updating IRS Publication 1281, Backup Withholding for Missing and Incorrect Name/TINs, if any changes are made to the B-Notice solicitation procedures reflecting the issues unique to the barter industry. The barter industry would be relieved of the undue burden of unnecessary penalties for failure to comply with a requirement that is impossible to comply with on its face. Internal IRS education on the issue would reduce campus burden. Amending the B-Notice to provide a barter specific B-Notice would increase compliance in the barter industry, thereby reducing the need for 972CG penalties, waiver requests and appeals. The exemption of backup withholding for Barter Exchanges would further reduce IRS burden by eliminating a backup withholding requirement that on its face cannot be effected. In addition, modification of the B-Notice to exclude reference to the backup withholding requirement, or to include a reference that backup withholding will be effected to the extent feasible, increases the credibility of the solicitation, which is currently diminished as the result of reference to an action (backup withholding) payees understand would be impossible to take. Moreover, it is now industry standard for Barter Exchanges to use the IRS TIN Matching Program at account set-up to ensure that the proper name and TIN are obtained. Accordingly, most of the accounts appearing on the CP2100/CP2100-A have long been closed and those account holders are no longer doing business with the Barter Exchange. Consequently, granting such an exemption or modification would not represent a significant loophole, since Barter Exchanges already require current W-9s from all their clients before proceeding to conduct business. Both education of the barter industry and/or amended B-Notice language specific to the industry will result in more compliance. The exemption of Barter Exchanges from backup withholding requirements would not increase taxpayer non-compliance, as the barter industry, through use of the IRS TIN Matching Program, already insists on proper Name-TIN matching as a prerequisite of doing business with the taxpayer.